Many critical physiological and biochemical processes in plants are adversely affected by Magnesium deficiency, leading to impairments in growth and yield. 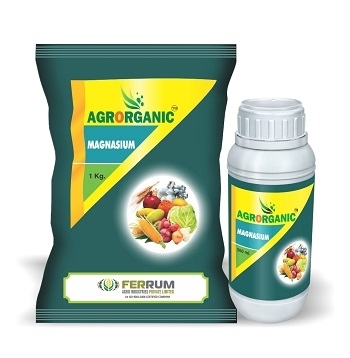 AGRORGANIC® Magnesium is complex formed by Amino acids, Gluconates and Magnesium in readily available form for the plants. AGRORGANIC® Magnesium addresses the magnesium deficiency . Gluconates and Amino acids helps in better absorption of the mineral by the plant. Recommendation: vegetables, maize, fruits, cotton, Cereals, horticultural crop and all other crops. - Enhances synthesis of organic compounds that are useful for plant growth and functioning. - Helps in chlorophyll formation, hence increases the photosynthetic rate. - Increases the yield & quality of the produce. - Aids ATP formation in chloroplasts. - Source for magnesium which acts as an enzyme activator and also a constituent of many enzymes. - Helps in Synthesis of amino acids and cell proteins. - Facilitates the utilization of other important nutrients by the plant.